Come on, be honest. How many times have you heard “The airplane is landing…”, sung to the same mindnumbing tune, around little kids? Of course, there never was a plane, and perhaps you’ve lived in fear of the day when all the children would realize they had been duped all along, and rise up in a bloodthirsty revolutionary coup. You can now help save the bloodshed with the Babyplane, designed by Nicolas Trub for Stilic Force. 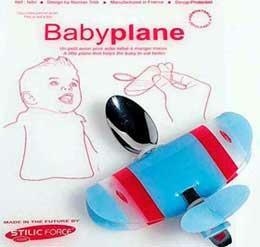 It’s a spoon with an actual (toy) plane attached. For $14 you can finally give some meaning to that jingle, and maybe even cram a little more apple puree into baby. Get it here. Story VIA Popgadget. Who Likes a Babyplane? Yes you do! Plane??!! What happened to the TRAIN!